Forge-Rx’s total wellness program has been so successful in transforming the lives and wellness of our members that we are proud to announce that we are opening a second location! We are excited to offer 6,000 square feet of wellness at the same great price! When you become a member at one location, you have access to both! Our new fitness center will feature an accessible front desk, showers and changing rooms, a childcare center, fitness areas, and a medical weight loss center in addition to group fitness classes. Wellness options to help you reach your peak state of health. Forge-Rx gym memberships include access to all of the amenities listed above as well as unlimited fitness classes. Each membership includes one body composition test, a nutrition consultation, a wellness appointment, and access to a personal trainer and medically-assisted weight loss programs if you’d like to expand your membership. All memberships include access to both locations —Braselton and Winder— and free childcare while you workout. Massage packages are available to members at a discounted rate. At Forge-Rx, we offer a different perspective on fitness training —completely tailored to each member’s wellness goals. 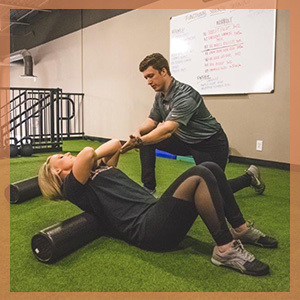 Our personal fitness coaches are excited to guide you through your fitness journey and help you find a plan that fits you best. We offer a variety of group fitness classes including strength training, weightlifting, spin class, and movement and mobility classes to help you stretch. Our certified fitness trainers can help every member of a group fitness class to reach their goals —whether you are new to the gym or you are a competitive athlete. No fitness program is complete without a nutrition program. After all, it is food that is the fuel to physical performance. At Forge-Rx we have nutrition coaches on staff who will identify your strengths and weaknesses as well as account for your preferences and dietary restrictions and then offer suggestions to help you reach your weight loss or physical performance goals. Our nutrition experts will follow-up regularly and you’ll have access to our private nutrition page full of recipes. Health and wellness encompass much more than diet and exercise. For you to reach your wellness goals, you need to address your total health. To help grow and nurture your total being, Forge-Rx offers medical weight loss options to help you put your best foot forward. We also offer massage therapy as a way to relax or to help treat overworked muscles and injuries. If your health and wellness goals include your total person, you need more than a simple gym, you need Forge-Rx! Stop by either one of our locations and sign up for your obligation-free 5-day membership. Try out our facility and all the various health and wellness options we mentioned above. We are sure that you’ll love it and we can help with your transformation. Take control of your wellness and get started today!